We are open to the general public during iris season, May 1 to July 7, 9:00 am to 5:00 pm. It is also advisable to call ahead for peak bloom of any particular iris class that you may wish to see. Garden clubs and individuals can also visit the gardens at other times of the year by appointment. Besides the iris fields, we garden several acres using native plants from the Pacific Northwest, Europe, China and Japan. Gardens are well marked and labeled. Parking and restrooms located at the barn. Mt. Pleasant Iris Farm is located in the scenic Columbia River Gorge in Washington, six miles east of Camas/Washougal on State highway 14, mile post 22.9, at 12 Marble Rd. 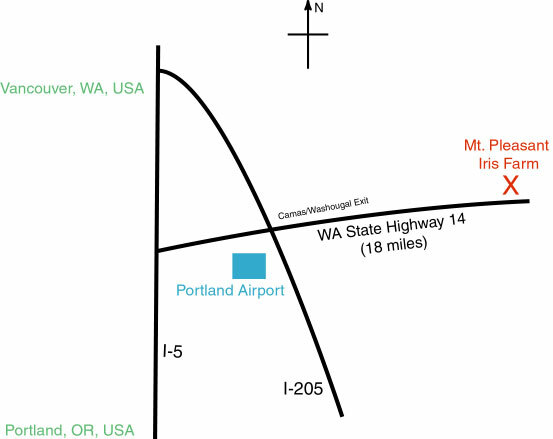 We are a short 25 minute drive from the Portland International Airport.